A guide to the hero Amily, the Crusher. Amily uses her superior mobility and increased damage toward singular targets to pick off enemies one by one. Amily is a Warrior/Tank hybrid that plays a bit like an assassin. Her Duel passive gives her greatly enhanced damage on single targets, while the passive effect on Combo allows her to quickly rotate between lanes and ambush unsuspecting heroes. The somewhat contradicting identities of being a strong dueler and strong ganker lead to her being a surprisingly difficult hero to master, even if her base kit is simple to use. Strong Burst Dueler – Amily’s Duel passive gives her a whopping 50% extra damage when her attacks damage a single target. 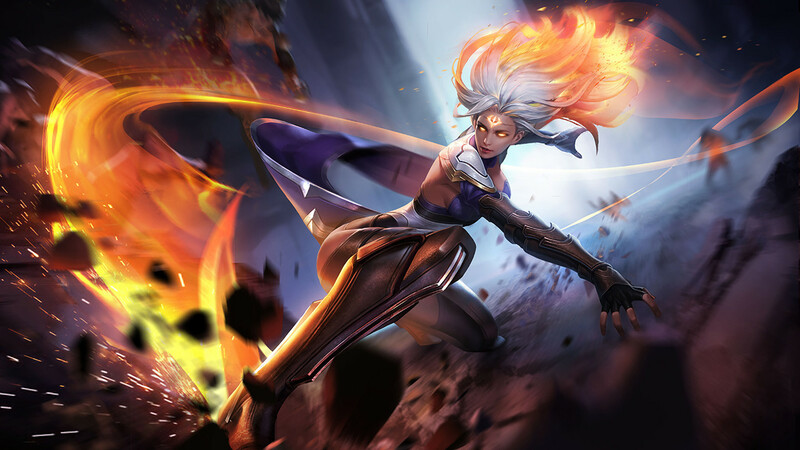 Plus, the “additional damage” is not treated like typical “additional damage” in Arena of Valor, meaning all of the effects are multiplied when calculating things like critical damage. Excellent Mobility – All of Amily’s abilities provide her with increased mobility, while Combo gives her both a dash and increased movement speed outside of combat. Amily is thus great at either ambushing/chasing or retreating from a fight. Weak to Burst – Amily’s Enrage ultimate ability defends her from all incoming damage by a fixed amount, which is great against heroes who rely on consistently burning down the enemy but less so against heroes who can chunk a hero’s health pool with one hit. After all, 1000-80 is still 920. While Kickblade heals a small amount consistently over time (given enough time for it to come off cooldown), it’s not enough to overcome an onslaught from a bursty damage dealer. Awkward Ability Synergy – Combo is Amily’s greatest source of CC, capable of knocking multiple enemies up and back, yet does greater damage when it’s only one enemy. In addition, it’s her best gap-closer, yet you’re better served knocking the enemy into your team rather than away from them, meaning the gap closer and knock-back would be much more useful if they were on separate abilities. Finally, Duel initially seems both in name and in function to imply that Amily should be in the solo lane, yet the passive on Combo implies she should be roaming the map looking for kills. Though the jury is still out, we believe Amily is best suited to the jungle. Duel works well on monsters and can be countered by the opposing solo laner by simply standing in the minion wave. In addition, the passive ability on Combo allows her to easily gank unsuspecting enemies. Combo is great at closing the distance to the enemy, but if possible, use this combination of abilities: Enrage and Kickblade to close the distance (Kickblade can be used while “charging” Enrage), then get in front and Combo backwards to knock the enemy into your team. Always begin with Combo as it is two abilities in one, and can help you both escape and regenerate if you get into a scuffle early on. At level three and onward, it’s up to personal preference. Each level of Kickblade provides 30 increased damage per bounce and 25 increased heal, while not improving the cooldown speed. Each level of Combo, on the other hand, increases all three hits by 16 damage, increases the passive movement speed by 2, and cooldown by 0.2 seconds. While we prefer leveling Combo, it’s close enough that players who prefer poking can go with Kickblade. As always, level Enrage whenever possible. Five different stats get upgraded with each level up – most important being attack damage increase – so it’s certainly worth your while. Ganking: Amily’s increased movement speed out of combat is of great use when ganking. If possible, get in front of the enemy, using Enrage for increased damage and Combo them back into your team. If not possible, then the slow from Kickblade along with the stun from Combo may be enough to finish them off. Though difficult to pull off, you can “prep” your enhanced normal attack by using Combo, charge to the enemy using said enhanced normal attack, and finally use another Combo to push them back. The timing is extremely difficult though: you only have five seconds to use the enhanced normal attack after your first Combo, but need to have the second Combo (which is on a 7- to 6-second cooldown) available in time to use before the enemy escapes. The full combination is: Combo, wait a couple seconds, Kickblade, enhanced attack, Enrage, Combo backwards, enhanced attack. For some reason, using Enrage after using Combo “turns off” the enhanced normal attack, so you have to use the enhanced attack before using Enrage. One on One: Try to fight the opposing hero away from minions and monsters so that you deal increased damage. Use the combinations listed above under “ganking,” making sure to burst them down as quickly as possible. If you do not get a quick lead in a fight against a strong solo laner, then run away – their cooldowns are likely shorter than yours and they probably have better sustain. Team Fights: Amily doesn’t quite deal enough damage to chunk through tanks, so head for the back line and pick off the squishy targets. Alternatively, Combo can be used to CC multiple members for your team to follow up if the opposing team is grouped together. Escaping the Battle: Every one of Amily’s abilities can be used as an escape tool, including Enrage if you’re in a real jam. In general, you should Combo away, then Kickblade back to your enemies to slow them down. You can also Kickblade minions and monsters to increase your movement speed and heal. Duel – Passive – When Amily’s physical attacks and Combo hit only one target, she deals 50% additional damage. Amily can also push down towers quickly if left alone. Just make sure not to hit the minion wave while attacking if your goal is to burst the tower down ASAP. Kickblade – Amily flings a blade hidden behind her leg. After hitting the initial target, the blade bounces up to 4 times between enemies, dealing 150/180/210/240/270/300 (+ 0.6 AD) physical damage and reducing the targets’ movement speed by 30% for 1 second, with the initial target taking an additional 50% reduction. Amily gains 20% movement speed for 3 seconds after the blade returns to her, her health is restored by 125/150/175/200/225 (+0.5 AD) and the ability’s cooldown is reduced by 30%. Combo – Amily launches into a chain of attacks, dealing 80/96/112/128/144/160 (+0.3 AD) physical damage. The second hit knocks her target in the air, and empowers her next normal attack to deal an additional 80 (+0.3 AD) physical damage with a charge effect. Passive: Amily recovers 1% of her maximum HP and maximum Mana per second and gains 10 movement speed after exiting combat. Though the length of Combo is an okay 700 units, the width is massive, affecting targets in a huge swath. Enrage – Amily becomes enraged after 1 second, dealing 300/450/600 magic damage, gaining 100/150/200 attack damage and 50 movement speed and becoming immune to 50/75/100 damage. While enraged, she also deals 60/90/120 magic damage every second. The damage reduction listed is very confusing: essentially, 50-100 damage is subtracted off every incoming damage source, from attacks to abilities to item auras. Compared to Zanis‘ Dragon’s Wrath, Amily takes less damage than he does when the incoming damage (after accounting for armor/magic defense) is less than 400, and more damage than he does when the incoming damage is greater than 400. Since there are a lot of burn and aura effects, she generally takes less damage. Since Amily doesn’t have the greatest sustain anyway, we decide to focus this build on killing the opponent before they can kill us. Soulreaver and Omni Arms bring the CDR to 25%, while Rankbreaker not only helps pierce through the opposing armor but the passive synergizes with Amily’s passive, making her Batman-like roaming around the map. Fenrir’s Tooth synergizes with Amily’s passive, bursting down unsuspecting enemies. At the end of the game, Blade of Eternity’s 10% damage increase will pay huge dividends, while the revive passive can either allow Amily to escape or finish the job. Clearing the jungle as quickly as possible and picking off your first unsuspecting target is key, so a full damage set of Onslaught/Blitz, Assassinate/Guerilla, and Skewer suits the Crusher wonderfully. Indomitable, Benevolence, and Skewer is a decent hybrid build, giving Amily good sustain while still allowing her to dish out damage. Amily should ignore most tanks, as they are mostly a waste of time for her. Using her abilities on tanks will leave her without an escape, and will probably not end in a kill anyway. Like with tanks, Amily should stay away from the more resilient warriors, while targeting those who are a bit more squishy. If Amily can’t chunk them down to half health with her initial flurry of abilities, then they aren’t worth engaging. As Amily operates similarly to an assassin herself, defeating an assassin means getting the jump on them first. Either that, or wait out their abilities before pouncing. Immobile mages are Amily’s primary target, as she can close the gap and burst them down before they have a chance to retaliate. Just be wary of any crowd control that halts you in your tracks before you can reach them. Marksmen are the other source of Amily’s prey. Amily has juuust enough sustain to hold on before she can wipe them out with her ability combination. Landing Combo in particular is of utmost importance, so as to interrupt their barrage of normal attacks. The tankier the support, the more they should be ignored. In addition, supports are more likely to be with another hero, lessening the chance of being able to pick off a singular target. Probably best to move on unless they’re clearly out of position. idk i think amily is much better than zanis. although i will admit that she is dependent on her ult and cr items. however, in the late game and with the right build she can be very very strong.